King Kamehameha I or Kamehameha the Great is a much-appreciated figure in Hawaii’s history, for it was through him that the islands were united after a successful military campaign that led him into power in 1810. Hawaiians celebrate King Kamehameha day on June 11 with a ceremony that includes the draping of his statue (you can catch a glimpse of it in the opening of the CBS show Hawaii 5-0) with giant leis brought from different communities in the state, a parade, a street fair and a block party that take up the entire weekend. While researching events in Oahu, Renata came across the schedule for the ceremony and saw that we would be fortunate enough to be able to attend it – and we immediately put it in the schedule of things to do during the trip. By our third full day there, we had more or less settled into a routine – mornings would be dedicated to relaxing at the beach while the rest of the day would be about exploring.On Friday, we had breakfast at the Capital One 360 Café (one of the few outposts the former ING Direct has around the country). We ate and checked our emails taking advantage of the free Wi-Fi, and then headed to the local post office to send out a few postcards and gifts.We then headed to the beach – the day was a little overcast, but that did not bother us. We were right in front of the Shore Bird Ocean Bar and Restaurant, so when rain briefly began to fall, we took shelter there and cooled off with a pint of Longboard lager on tap. After a few hours in the sun, we visited The US Army Museum located just at the entrance to the beach. 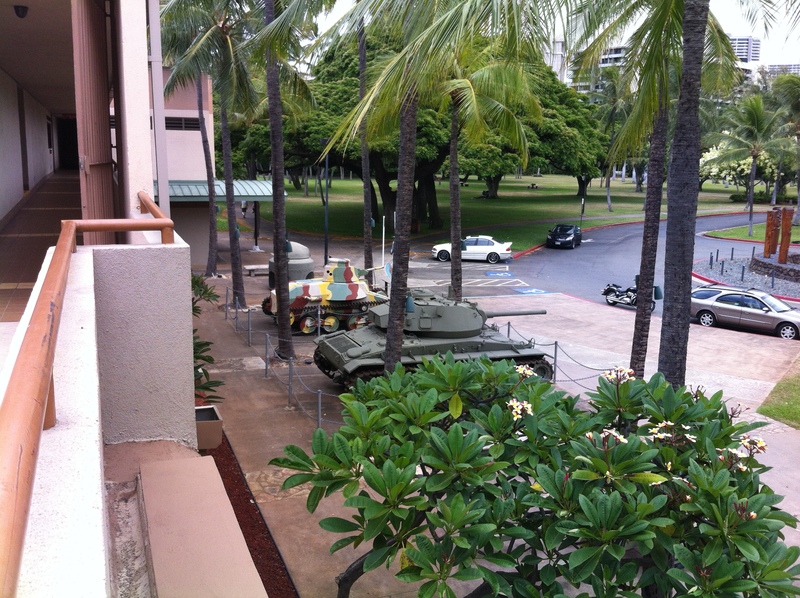 The small, free admission venue dedicated to the history of the military on the Hawaiian Islands from the days of King Kamehameha all the way to present time.The museum is located in a former fort built in the early 19th Century to guard the island from outside attackers. Now it houses various artifacts from different military eras – including machine guns used by the Japanese army during World War II. They also have a beautiful memorial hall for all the Hawaiian-born soldiers lost in different conflicts all the way up to Iraq and Afghanistan, and a rotating video acknowledges the mistake of interning Japanese-American citizens in camps during the Second World War. After that, we walked back to our hotel, changed and headed straight downtown for the ceremony, stopping on the way to grab a couple of sandwiches and sodas at a nearby Subway location (yes, they are plentiful there too).As we reached the Judiciary History Center, we found a place on the grass as a local band performed Hawaiian songs. The ceremony began with a number of speeches, including one from Democratic Honolulu mayor Kirk Caldwell , who spoke of Kamehameha’s virtues, his ability to unify the islands and ended by saying that if we could be a little more like him, we could all be better people. 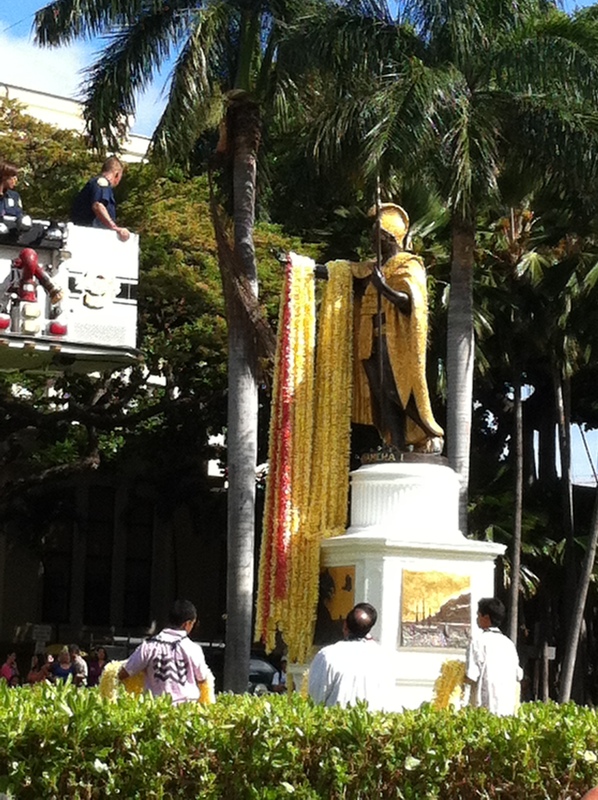 Then the draping began – tens of giant leis were carefully placed, one by one, by Honolulu firefighters using a fire ladder.Each of the leis was handcrafted by members of different native Hawaiian communities around the islands, and it the whole process must have taken just over an hour. It is quite admirable how they respectfully and carefully place the flowers on each of the statue’s arms – a ceremony that also takes place in Hawaii’s Big Island and at Capitol Hill in Washington, D.C., where replicas of the same statue also exist. Following the ceremony we began making our way back to Waikiki, but because of street closures we had to change buses, and this made for a long ride. We were originally planning to watch the weekly fireworks display on the beach, but instead we rested a bit and headed to dinner at Little India, a nearby restaurant we found via Groupon. The restaurant is located on the ground floor of the Waikiki Landmark building (the penthouse can be seen on the opening of Hawaii 5-0 when the camera zeroes on actor Alex O’Loughlin). Dinner was quite spicy and satisfying – we both ordered koftas (a veggie ball made with chickpea flour, cabbage and cauliflower), and washed the meal down with white wine. The staff was very friendly, and we lengthily chatted with the owner, an import from Eastern Pennsylvania who’s been in Honolulu for over a decade. We then walked down Kalakaua Avenue, where a street fair was taking place as part of the Kamehameha festivities. Given that we were very full, we did not sample any of the food being sold there, but were happy to see a presentation of Japanese Taiko drums and a snake-slaying dance – two thrillingly unique shows we rarely see here in New York. It must have been around midnight when we headed back to the hotel and rested for what turned out to be a very long Saturday. We stopped at the ubiquitous ABC stores to replenish our water supply and then rested for the day ahead – which turned out to be one of the most tiring of our entire stay.